I have been going to Ace Water Spa since 2005, and it’s still the place I love going back to when I want a massage. What’s not to love? It’s just a short taxi ride away in Quezon City, and it’s basically just one big swimming pool. Unlike other spas, at Ace, you don’t just lie down and have someone massage you. You’d have to move to different massage stations, depending on which part of the body you want massaged. Also, at Ace, instead of hands massaging you, it’s water. It’s either water pounding down on your body or water jets hitting the pressure points. Hydrotherapy or “water therapy” is the treatment of disease through the use of water. Hydrothermal therapy is the use of water temperature, such as in hot tubs or spas. The focus of Hydrotherapy is to rid the body of toxins that may be causing joint pain and inflammation. Hydrotherapy treatments are also helpful in managing chronic conditions such as rheumatoid arthritis and osteoarthritis. They are very strict: each patron must be wearing proper swimming attire, up to the swimming cap (which they provide upon admission). Board shorts and t-shirts are not allowed past the entrance to the spa. If you don’t have any swim suit, they are selling suits starting at Php 250, or you can rent (*cringe*) for Php 100. Ace Water Spa is now attracting more patrons than before, even with their price hike. When I first visited Ace, the first thing I noticed was the number of seniors using the facilities. Last Monday though, it was mostly parents of kids who were taking swimming lessons, and couples in their 20’s. 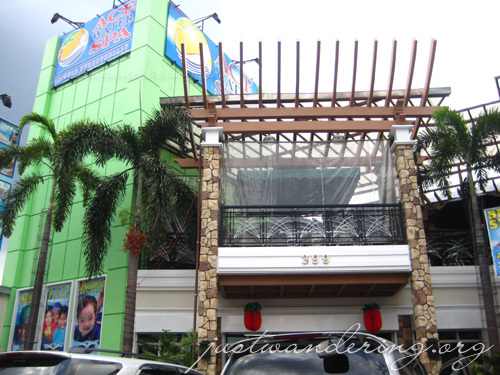 Adults are charged Php 550 and kids (4ft and below) Php 250 for the use of the facility. It may seem pricey, but that Php 550 is good for 4 hours use of all their facilities: the spa pool, the lap pool, the heated herbal baths, steam room and sauna. They have an ongoing promotion: Buy 2, take 1 in the morning (6am – 12 noon), buy 3, take 1 in the afternoon (12:15pm – 8:30 pm) on weekdays except holidays. It’s best to take advantage of the weekday promo, because it wouldn’t be as crowded as the weekends. I went there last summer on a Sunday and the place was turned into a public pool. Not fun. If you have the time before or after work, swing by Ace Water Spa and relax. If you look to the right, I’ve installed an Events Calendar plugin, that basically lets me list upcoming events, which I think might be of interest to JustWandering readers. If you have (or if you know of) a travel-related event, drop me a line using my contact form. Two events happening next weekend, which I’m particularly interested in (and will attend) are Youth Trip’s Travel Writing with Chen Mencias and the 1st Pinoy Backpacking Festival. The travel writing workshop will be held at the Hope Center, Aurora Millenium Tower, Katipunan corner Aurora Avenue, Quezon City. The event will start at 1pm, and has a Php 100 registration fee. For more info, visit YTrip’s Multiply site. The backpacking festival on the otherhand, will span three weekends in various locations in the metro. The first will be next weekend at the Trinoma Mall, then moves to the ROX store at Bonifacio High Street, then on to the Alabang Town Center. For inquiries and registration, visit the ROX Multiply site. i always wanted to try that. maybe soon. ill be attending the 1st backapcking festival. Hey Nina! I’ve never been here, ever! Been passing it every so often but never got the chance to try it out! Looks tiny from outside! It’s big pala?! See you at the festival, Dong Ho! Didi: You should! It’s a really big place, unassuming lang talaga from the front. It occupies the space behind the BPI bank beside the spa. nakakainggit with all the events you have listed there.. hehe. have fun! would you still recommend this spa for those of us who are conscious of our bodies? in other words di ba nakakahiya sa mga katulad kong mataba? Is it really true that cams are not allowed inside the spa? So how did you take the photo above? Planning to go there this week with the fam. Thanks! The note about the travel writing workshop reminds me of the travel writing workshop at Sonya’s Garden in Tagaytay. Whoa, I was supposed to blog about it but totally forgot! Will check it out again. weLLow po..just wondering about your header..san po ung location nyan? it reminds me of my hometown ‘Donsol’.. s ‘dancalan’ po ba yan?..anyway.. i would like to ask permission if i can use you ace water spa photos for my proj (one-page ad of ace water).. ill drop by again here in your site to check for your reply or can you please send your reply thru email? thanks in advance..
you now, ace is really the best pool i have been. is the entrance fee for those who don’t like to swim the same for those who will use the faicilities? my father doesn’t want to swim kasi… sayang ang entrance fee. Tin, he can stay at the Lounge, where he has a view of the pools, but he can’t go to the spa and pool area mismo. 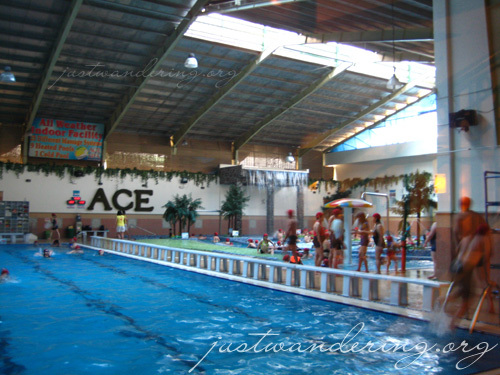 i love ace water spa too! went to Ace Water Spa today May22,2010 Very Dissapointing experience my van was damaged by a ten wheeler truck while it was parked in their official parking space , Ace Water claims no responsibilty to the damage done to my van …..adding insult to injury no rebates were given when we asked because we swam for only few minutes , food not good service slow, your legs and buttocks will get itchy, staff very unfriendly,security lapses of Ace Water Spa may cause you life and limb. My wife and I went here but I did not really like it. They try to separate the men and women for some reason? They did not want my wife and I to be in the same hot tub pool together. I can’t understand this logic? When I go to a spa to relax I don’t want to be taken away from my spouse , I dont see why they can’t go in together? Been there just once. Wish I could go back again! I’ve been planning to relax here since last year pa. Kailan kaya..? Is it safe for pregnant woman? I have yet to see any pregnant women there. Best to call the spa or ask your doctor.